The quality of the elephants themselves was good and they were actually heavier and more substantial than I thought they would be, which was a nice surprise. However, about 30% of the 12 I received did not hold a place card properly in the slot on the top/back of the elephant. I was not able to display all 12 placecards that I needed appropriately. Q:Our wedding is in Auguse 2017 if I buy these elephants now will they tarnish by then? A:This product is made out of gold resin and will not tarnish. Q:Are the place cards that are provided on an 8x11 sheet that you can print on with perforated edges to separate? Q:Does this product include the placecards with the design in the picture, (blank of course)? A:Yes, the placecards are included. Q:Not sure what golden resin is, in terms of texture what is it made of? A:Resin is the material used similar to plastic. 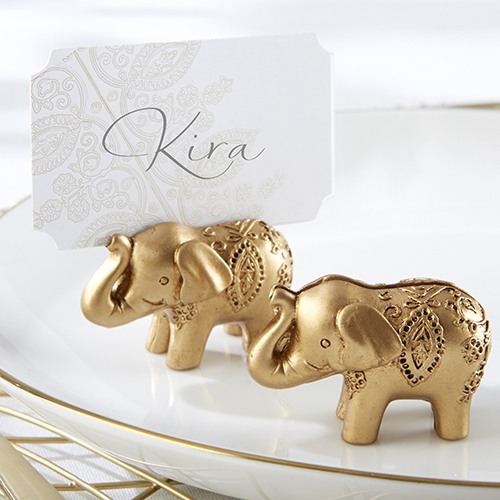 Is there any better way to set your wedding guest tables then with these lucky golden elephant place card holders? These are perfect additions to any exotic wedding, and make a cute momento for your guests to take home as favors too. Finished with antique gold resin and decorative detail, your wedding tables are going to look so lovely.